Trying to land freelance clients can be difficult. Confusing, even. Where do you find them? And once you find them, how do you compete with all the other freelancers out there? Finding clients can also be time consuming. You could easily spend hours responding to bids, cold calling or emailing, and scrabbling for scraps. At the end of the day, you would have spent your time on high-effort activities that have very low payoff. 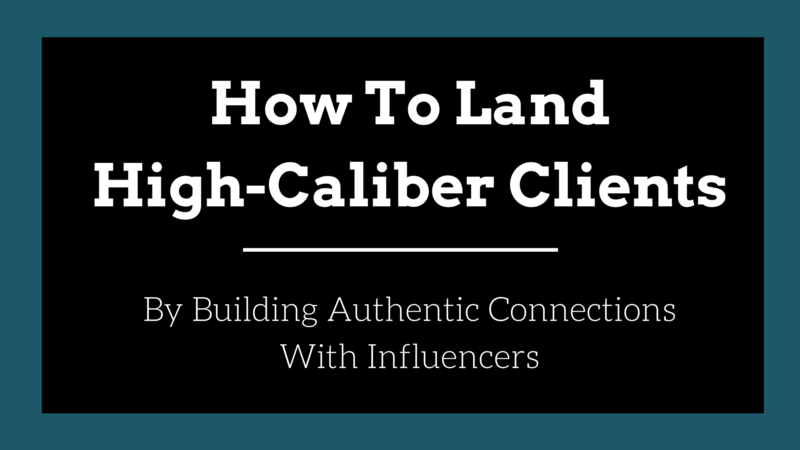 So how do you find high-caliber clients who are begging for your services? Better yet, how do you set processes in place so they find you instead? High-caliber clients are clients who are happy to pay premium prices for your services. They come back over and over again, wanting more of your work. They tell their friends how great you are. They are your champions. They are the opposite of problem clients, clients who challenge your payment structure, who insist on extraneous, time-consuming changes that are way outside of the project scope. These are the clients who make your time worthwhile, who cause your business to thrive. So how do you find this kind of client? It’s a bit roundabout, actually. First you find influencers, people who hold high levels of social collateral. They have large networks of trusted advisors and friends. They hold great expertise, knowledge, and authority– when they speak, people listen. They take their advice. Influencers are not your target clients, but you can bet that they know plenty of people who are your target clients. 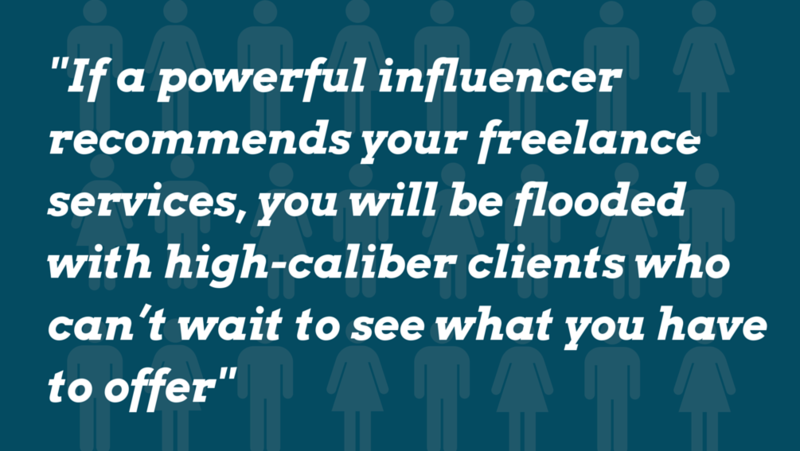 If a powerful influencer recommends your freelance services, you will be flooded with high-caliber clients who can’t wait to see what you have to offer. In order to get on an influencer’s radar, you consistently build memorable interactions. You actively cultivate an authentic relationship. Once you demonstrate genuine desire to help others (and an ability to provide exceptional value), you make it as easy as possible for influencers to refer clients who need your help. Sound intimidating or foreign? It’s not. I’ll walk you through it. Let’s start with how you find influencers, then move on from there. Do you know what your ideal client looks like? If you had to define their parameters, get really specific about exactly who they are, what they do, and where they hang out– could you do that? This is an important step to take because the more specific you are about who you want to work with, the better your referrals and introductions will be. To get started, check out this article on targeting markets. Once you can describe your ideal client, go out and research them. Learn as much as you can about where they hang out online. Go to those websites, those forums and social platforms. Listen to what they’re saying. Look at who they follow on Twitter, who they retweet and favorite. Who they interact with. Look for the people who are followed by multiple ideal clients. These are the influencers you want to connect with. By connecting with these people, you will open up a new world of high-quality leads and networking opportunities. More specifically– you’ll have tapped into a lifeline for your business. The best way to connect with an influencer is to provide value. Be useful. This will set you apart from all the other people who are trying to get their attention for purely selfish reasons. A great way to add value is by following them on social media. If your influencers hang out on Twitter, create a list (make it private) that you populate with influencers. Then get active in this specific stream, by retweeting and adding comments and engaging. If they’re on Facebook, follow them or like their page. Add comments that engage, instead of spam. You can also visit influencer blogs. Subscribe to their newsletter if they have one. When you get the emails, hit reply and let them know your thoughts. Give feedback on what you liked and didn’t like. If they offer advice on one of their blog posts, take ii. Then come back and comment on the post (or email the person directly) and let them know the results you got. These are amazing ways to create value and get on someone’s radar without coming across as spammy, salesy, or slimey. If you’re thinking “there’s no way I can do this!”, hear me out. I’ll share something personal. I am an absolute, total introvert. On a DISC assessment, I score a 3% on the section that measures my ability to connect with others. No joke. Despite my personality completely lacking natural magnetism, persuasion, poise, or warmth, I’ve built relationships with powerhouses who have referred high-caliber clients left and right. In fact, about 90% of my freelance business came through influencer recommendations. So even if you are afraid that you can’t do it, you can. Start slow. Dismiss any assumptions you may have– “they’ll think I’m a fraud!” or “they won’t think I’m worth their time” are common. In reality, influencers are extremely busy people. They don’t know you enough to judge whether you’re a fraud or worth their time– but they will notice if you go out of your way to provide consistent, authentic value to them. Once you’ve found your top influencers and started to get on their radar, you don’t want to lose traction and become forgotten. Find a list of articles that the influencer may find interesting. Use an email add-on like Yesware or Boomerang to schedule the email for delivery in a few weeks. If an influencer has an important event coming up, like a talk or cause that they support, use Yesware or Boomerang again (or Tweetdeck if you prefer Twitter) to send a quick note with warm wishes. Set aside 30 minutes every morning and dedicate that time exclusively to finding new influencers and cultivating relationships with your existing list. By continuously delivering value instead of simply asking for help right away, you will begin to build an authentic relationship with someone who appreciates your contributions. By this point, you’ve spent a lot of time cultivating authentic relationships. You’ve given tons and tons of value. You’ve positioned yourself as someone who is reliable, knowledgeable, and a giver instead of a taker. Influencers are incredibly busy. Make it as easy as possible for them to help you. Because you’ve already gotten really specific about your ideal client, you should be able to write down a quick blurb that describes this client. Make it 1-2 sentences long. For example, “I work with high-end restaurant owners who want to increase their revenue by offering online ordering. I help them by building the backend systems that allow customers to easily and efficiently place orders online”. Once you’ve done this exercise, set it aside. You’ll use it in a moment. First, reach out directly to your influencers and explain your situation. For example, maybe you’re brand new to freelancing and want your first clients. Or maybe you’ve been freelancing for a while and are looking to expand to new clientele. Ask if they’d be willing to help you out. Let them know it won’t take much of their time, and that you’ll make it as easy for them as possible. Once they say yes, send them your ideal client description. The reason you don’t want to send it right away is that you don’t want to appear presumptuous. You want their buy-in and goodwill. If possible, do research ahead of time and identify those clients that are in their network. Ask specifically for an introduction to those clients. 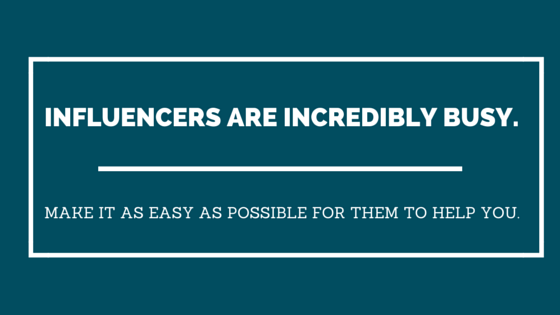 This will make it even easier for your influencers to help you out. By treating these interactions with respect and showing gratitude (regardless of whether they choose to help you or not), you will position yourself perfectly for getting high-caliber client introductions and referrals. Here’s your homework. Sit down and really define your ideal clients. Get as specific as possible. Next, begin to research them and find their influencers. The people they quote, they follow and retweet– those influencers. After that, start getting on the radar of those influencers by providing consistent, valuable interactions. Once you’ve demonstrated that you are a reliable, knowledgeable giver, reach out and ask them for introductions or referrals. Make it as easy as possible for them to help you. And after that? Keep providing value! Send useful articles, give feedback and engage. And you’ll soon find that you, yourself, have become an influencer. Joyce Akiko helps self-taught coders know when and how to transition out of their full-time jobs and into freelancing so they can be their own boss and experience freedom and flexibility every day. Download her report, “Supercharge Your Influence” so high-caliber clients can find YOU instead of the other way around. This report is completely free for SitePoint readers.